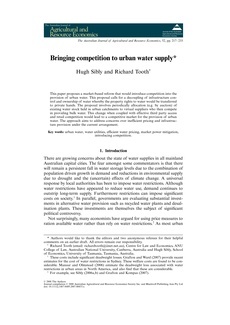 This paper proposes a market-based reform that would introduce competition into the provision of urban water. This proposal calls for a decoupling of infrastructure control and ownership of water whereby the property rights to water would be transferred to private hands. The proposal involves periodically allocation (e.g. by auction) of existing water stock held in urban catchments to virtual suppliers who then compete in providing bulk water. This change when coupled with effective third party access and retail competition would lead to a competitive market for the provision of urban water. The approach aims to address concerns over inefficient pricing and infrastructure provision under the current arrangement.